From the time I returned from Canada, I have been visiting teams who came to participate in our summer outreaches. In the course of the summer over 120 individuals came from many different countries. There were a lot of Dutch folk, as well as British, German, Swiss, American and even a few Canadians! Before each outreach we would conduct an orientation day and at the end of their two week outreach we would hold a debriefing day. These were part of my responsibility, as well as visiting the teams in between time. In the villages, the teams had many different kinds of experiences as they worked with the churches there and stayed in the homes of the local believers. One team arrived in a village late one evening, hoping for supper, only to be informed that the first order of business would be for them to build themselves an outhouse! Such is the life of a missionary! (So glad I have never yet been required to do that.) 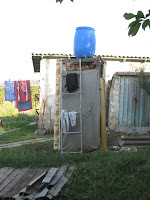 Here is a photo of the outdoor shower that same team had the privilege to use that week. But in spite of the challenges of basic living, the teams all came back with stories of how God had worked and of what they had learned during their time. It is always heartening to have at least 2-3 young people who are seeking God's direction in their lives and who come back from the outreach saying, "I believe God is calling me into missions." 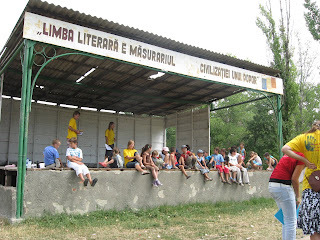 This is one of our goals in conducting these outreaches, as well as the primary goal of bringing God's love and mercy and hope to the people of Moldova. In one village where I visited, the team was doing practical work as well as running a children's program for 140 children!! The women of the local church were feeding all these children each day. 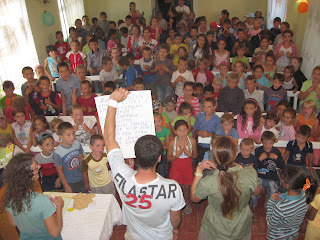 We were there for one of their closing programs and the children absolutely packed their current building. The church has already almost completed a new building that will have space to hold the children and also their parents and families!! We were very impressed by the vision of the pastor in this small community, who also preaches at 2-3 nearby mission points. There was another group that was very large, consisting of a youth group from Holland. Along with our OM team members, they worked with a local church to run a children's program in the local park, and to build a playground near the church. When you see the state of the park where they were meeting with the children, you will appreciate that a new brightly-painted playground will be greatly appreciated. One of the highlights for this group of young people was that two of the group members committed their lives to Christ in the course of their time here. There was great rejoicing and these two young men were eager to testify to their new faith in Jesus. Unfortunately on my way back from visiting one of the teams, Rosie, my car who had just returned to me from the repair shop, decided that she hadn't had enough attention. She wanted some more new parts and she wasn't going anywhere until she got them!! Sigh... we did eventually get home that night - Albina and I - but we left Rosie in Causeni to eventually be towed back to her own personal mechanic in Chisinau who apparently is the only one who can keep her on the road, as long as I keep paying for the parts! This week I am going with my team to our annual team retreat so I won't be around for a few days. Thanks for stopping by to visit - please do feel free to leave a comment! Posted by Barb at 5:55 p.m.